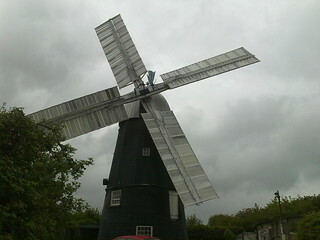 National Mills Weekend 2012 – visiting The Great Mill at Haddenham, Cambridgeshire. This weekend has been National Mills Weekend in the UK. The Great Mill at Haddenham, Cambridgeshire. I only realised that this was the weekend – but I was able to make the journey to The Great Mill at Haddenham, just 5 miles from me. The weekend also coincided with Haddenham’s ‘Blossoms and Bygones’ event, so the village was decked in bunting, musicians, fair rides and vintage vehicles. I’d been to the Mill a couple of years previously and the current owners were very kind to show me around this 5-storey mill both then and now. The reason I first went along originally was because of the unfortunate and violent death of my Gt x 5 Grandfather, Philip Newman, a miller and baker, died when he was caught in the workings of a mill. The mill is essentially a vast wooden machine. The mill (seemingly known most recently as ‘Neville’s Mill’) where he met his gruesome end no longer stands, but The Great Mill was standing opposite ‘killer mill’ back in 1809 when the accident happened. I wanted to find out what it would have been like to be inside a windmill similar to the one that my ancestor would have worked. A photo of Neville’s Mill which stood opposite The Great Mill and killed my ancestor in 1809. The Great Mill was built in 1803 by Daniel Cockle, and it’s still clear today as to what an engineering feat it was, with cogs, wheels, bells, sails all over the place – each with their own specific purpose in cleaning grain, moving it around, grinding it, sifting it etc. The Mill was handed down through the Cockle family for almost 100 years until 1901 when it passed to the Peters family. 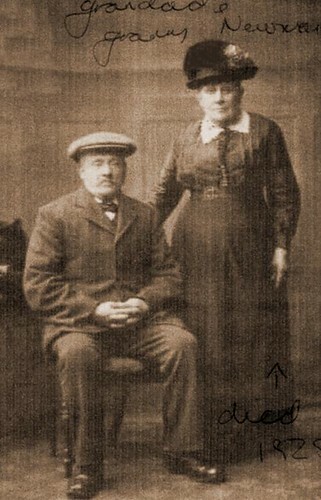 It then moved on to the Lawrance family in 1906 until becoming unloved in 1980. It stood derelict until 1992 when it was restored. 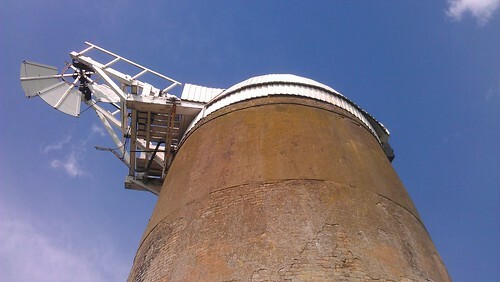 20 years on, and the Mill is undergoing a new restoration with the kerb (the part up in the top that allows the entire cap and sails to change direction) needing some attention. The current owners are busily restoring it, and hope to one day have it working again like the one a few miles away in Wicken (which i visited on National Mills Weekend in 2010). The working windmill in Wicken village, Cambridgeshire. 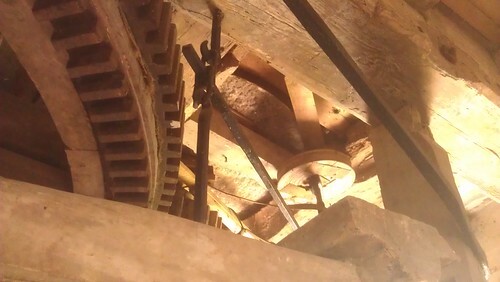 If you’ve never been inside a windmill, i recommend it. It is cramped, there are lots of awkward stairs/ladders to navigate, but it’s a wonderful experience. I imagine that millers like my ancestor Philip, would have been able to quickly ascend and descend those ladders, fueled by necessity. If you’re lucky to go into a windmill with its sails working, then you will soon realise the sheer power and complexity of them. And you’ll realise too that they aren’t noisy. Where once every village had a windmill, there are just a scattered few. The cheaper costs of importing grain from the likes of Australia in bulk and then milling it at the UK ports rather than sending vast amount of grain inland, quickly terminated the nation’s windmills and made our millers jobless. By the end of the 1940s/50s, working windmills were all but a thing of the past.